After an unseasonably dry summer here on our Pacific Northwest coast, the first of September arrived with a notable cool bite in the air. Today is Sunday, 20th of September, the day before the Autumn Equinox and the home has taken on the warm ambience known for the dark half of the year. Windows are closed, candles cast light and shadows and wonderful scents wafting from the slow cooker fill the air. It’s nice to be Home. Tomorrow we observe the first day of Autumn with a traditional Mabon feast. Mabon marks the second harvest. Day and night are of equal length and what says Autumn better than comfort food? Our dinner guests will delight in a red wine pot roast, herbed garlic mashed potatoes and cranberry brussel sprouts with gorgonzola cheese. Let the comfort food cooking begin! Season chuck roast all over with salt and pepper. Heat oil in a large skillet and brown all sides of the chuck roast well. Remove roast to a plate and add onion, carrots, celery, mushrooms and garlic. Saute on medium heat until fragrant, about 5-7 minutes. Add tomato paste and mix in; cook for a few minutes. Add red wine, bring to a boil, then reduce heat to medium-low and reduce wine by three quarters. Add stock, thyme and bay leaf and bring to a boil. Transfer sauce and vegetables to slow cooker; place roast on top, pressing down to submerge in liquid as much as possible. Cook on high for 4-5 hours until fork tender. To make sauce, remove 4 cups of sauce to saucepan; bring to a boil; stir in cornstarch/water mixture and cook until thickened, just a few minutes. 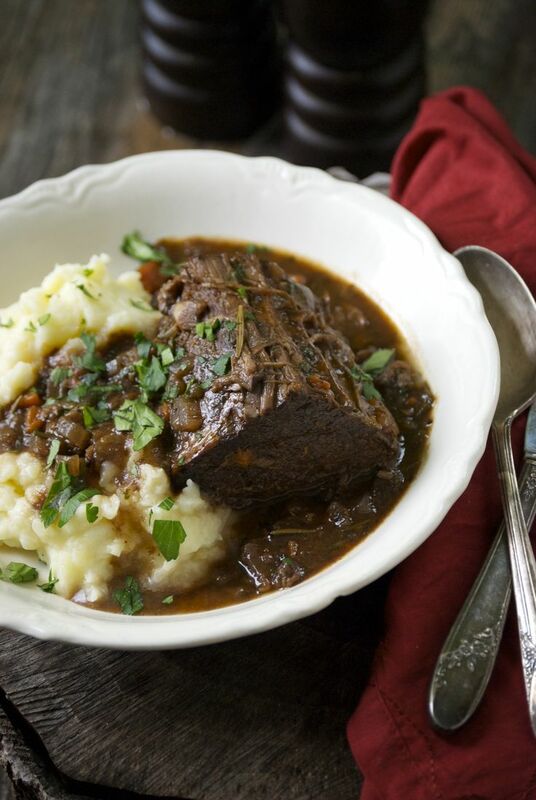 Slice pot roast and serve with vegetables and gravy. Nice start Jenn. Looking forward to future posts.